Sensor Girl aka Projectra (or “Jeckie”) of Orando, aka Princess Projectra, Queen Projectra, Sensor, Jeka Wynzorr, Wilimena Morgana Daergina Annaxandra Projectra Velorya Vauxhall. Created by Jim Shooter and Sheldon Moldoff. There are a number of different things going on with Jeckie’s character, and we might as well hit them all. First, she was a remarkably different character depending on just which era you look at her in, and some of these changes from era to era have been quite jarring. Threeboot: At the start of the series, Jeckie was a spoiled rich girl who bought her way into the Legion. She didn’t have any powers and Cosmic Boy was stringing her along so she’d continue to bankroll the team. Then Orando was destroyed, she became more determined, and inherited some superpowers. That was fine until Jim Shooter took over as writer and decided that she’d been kind of unhinged by what happened to Orando, and started to turn her into a villain. We never did see how that played out, and now it looks like we probably never will. Second, her powers are extremely intriguing and almost never explored to their full potential. Jeckie has the power to project illusions, amazingly comprehensive and realistic illusions. This is a very subtle superpower; it’s tricky to use right. 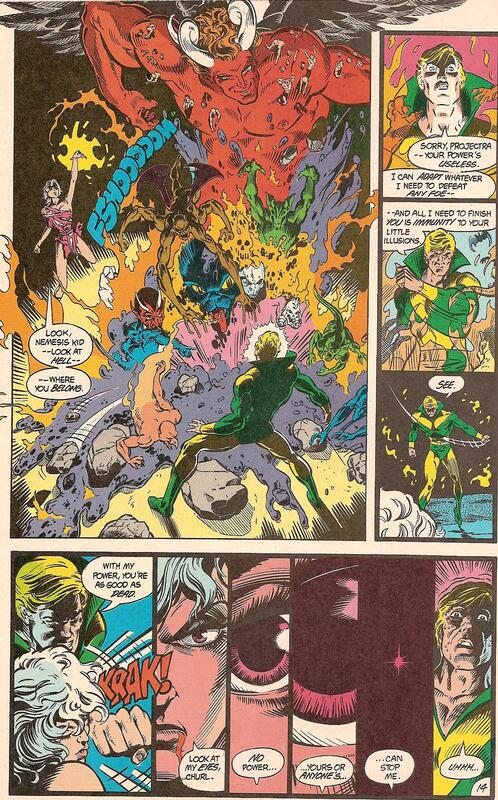 Most often, the Legion writers didn’t have a handle on how to use illusions effectively, and they’d have her conjure up a big monster or something, and it wouldn’t work very well. At times, on this site, I’ve dragged role-playing games into the discussion as a perspective for understanding this or that aspect of superheroes. I’m going to do it again now, because Dungeons & Dragons players have spent a lot of time figuring out just what illusions are good for. Do you understand why the D&D perspective and the superhero-comic perspective are different? It’s important: in the comics, stuff happens because the writer says so. Illusions work how he or she says they do, and that’s that. If the rules for illusions have holes in them, oh well. But in a D&D game, stuff happens because the players are trying to get an advantage over the opposition provided by the Dungeon Master, and the DM in turn responds to what the players do. Illusions work in a way that’s often negotiated between the DM and the players, and if there’s a hole in the rules, the players will exploit it to the fullest. You really do have to pin it down. Q: how many senses does the illusion cover? If it’s a mental illusion, all of them, probably, but if it’s an optical image, can the illusionist provide sounds and smells to go with it? Q: what if an illusionary monster hits you? Does his fist go right through you, or does your body “believe” the illusion and react like it got hit for real? If so, can you die from that? Q: if you realize that an illusion is an illusion, can you still see it, or does it disappear for you? What if you want to believe the illusion for some reason? And so on. I’m sure that Legion writers over the years have come up with inconsistent answers for these questions when it comes to Jeckie’s powers, so there’s no point in trying to answer them in this case. Basically, when the writer needs Jeckie to be useless, they let the villain ignore the insubstantial phantoms Jeckie sets to fight them; when the writer wants to soup her up a bit, he comes up with an idea like, the illusions get right to your subconscious and won’t let you disbelieve them even if you know better. 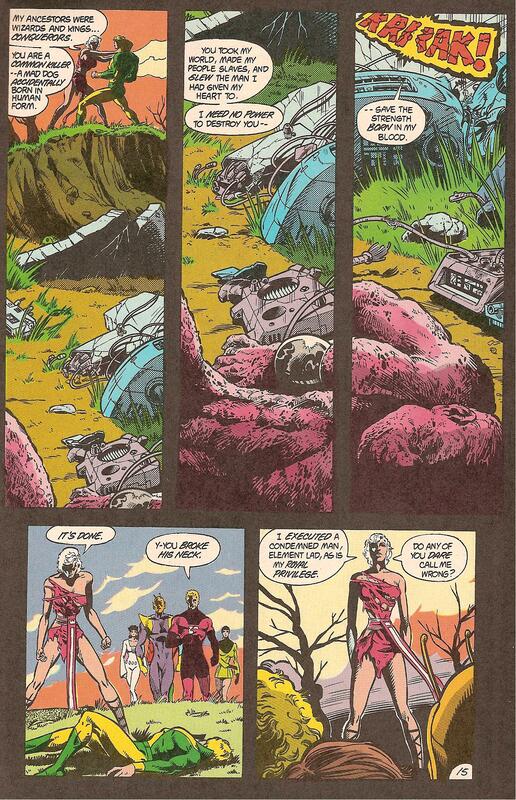 But Paul Levitz did even better than that when he turned Jeckie into Sensor Girl. See, the best weapon an illusionist has is to not let her enemies know that she’s an illusionist. Once they know you’re using illusions on them, they’ll be skeptical about everything and it’ll make your plans that much more likely to fail. Even worse, they’ll know that as long as they’re careful, they have nothing to fear, which just about gives the whole game away. So what did Jeckie do? She wore a mask and adopted another name, thus concealing from her enemies the fact that she was the famous Princess Projectra with the famous useless illusion powers. The name she adopted gave no hint that she could project illusions. And, finally, most importantly, the illusions she did use were never obvious ones. In the Silver Age, Jeckie mostly used the first kind. As Sensor Girl, she mostly used the third kind. Third, there’s her potential. I was reading a message board once and came across an idea that completely captured my imagination, and I wish I could find my way back to it so I could give full credit to whoever it was who came up with the notion. And that’s this: Jeckie should star in her own cartoon. It’s perfect! You want a young female audience? Here’s the show for them: a magical space princess on a planet of dragons and magic, having adventures and fighting her evil cousin Pharoxx (who’s being advised by Hagga), learning from the Orakills and getting ready to take over ruling the planet from her aging father King Voxv. Her boyfriend is the greatest martial artist in the history of people hitting each other and her best friends are teenage superheroes. Might go over well in a kind of anime style. Isn’t it obvious that Jeckie’s powers could be spectacular when presented in animation rather than comics? Is there no one at DC Entertainment who can see that this would be a license to print money? Unlike all of our other princesses so far, Jeckie does have female friends her own age; lots of ’em. Not sure how close they are, as friends, but they’re there in quantity (1 pt). That’s shocking. I didn’t think anybody was going to exceed Leia. But Jeckie does pull in points from all across the board.